The following is a spoiler-free review of Jurassic World (2015). It’s been 22 years since the original Steven Spielberg film, and it has been a bumpy ride for the franchise ever since. I, personally, enjoyed The Lost World – but understood why people disliked it. Jurassic Park III was, for most people, a disappointment. How good is Jurassic World? It’s actually very good. It’s not without its flaws, but I went into the film fearing the worst – and I was pleasantly surprised. Sure some might argue that it borrows too many plotpoints from the previous three films, but as some sort of fusion of Jurassic Park, The Lost World, and Jurassic Park III it actually works. Jurassic World follows Zach and Gray Mitchell as they are to visit their aunt, who just happens to be the park operations manager (played by Bryce Dallas Howard). 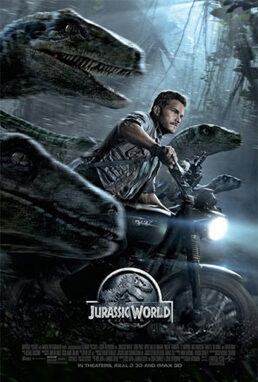 Meanwhile, Owen Grady (played by Chris Pratt) is training velociraptors that inGen wants to use as weapons. As the genetically modified dinosaur, Indominus rex, breaks free – all hell breaks loose. Let’s start off with the noticeable negatives. My main criticism with the film is how it begins – its opening 20 minutes being incredibly weak. It’s not that I desperately dislike the characters in the opening 20 minutes, but it just doesn’t work as a fresh opening. Similarly, without going into spoilers, I would definitely say that I dislike the ending scene. Basically, the film tried to tie up ‘loose ends’, but it ended up feeling too Hollywood. Another complaint that you’re going to hear about this film is the characters. It’s not that none of them are likeable – the problem is just that pretty much all of them are one-dimensional stock characters. Vic Hoskins (played by Vincent D’Onofrio) and Dr. Henry Wu (played by B. D. Wong) are probably the most problematic characters. Now, I really like Ty Simpkins – but Gray and Zach Mitchell are just not that interesting. One of the more annoying movie sins that the film makes is that for some odd reason phones and walkie talkies just don’t work on the island. Make no mistake, though, I really like this movie, and here’s why: For starters, the last act of this film is spectacular. It’s a plain action-heavy thrill ride. No spoilers, but that was probably the best last act of any Jurassic Park-sequel. There are two characters that stand out in a positive way. The first one is one of Hollywood’s most wanted: Chris Pratt. Fear not, this is not just Star-Lord on Isla Nublar – in this film he probably has 4 or 5 Marvel-like jokes, and in the rest of the film he is actually quite serious. The second stand out is someone that most people probably didn’t even know was in the film (not a spoiler, just a minor character). Jake Johnson plays Lowery, a fun tech-savvy mixture of Dennis Nedry and Ray Arnold. I really like Jake Johnson, and I was curious as to what role he played in the plot. I was really pleased, and he is probably my favorite character from Jurassic World. Definitely not the best film in the franchise, but Jurassic World is a worthy sequel to the original Spielberg-classic. And despite its flaws, Colin Trevorrow should be proud of the imprint he leaves on this proud franchise. Final Score: 8 out of 10 – The latest entry in the Jurassic Park-franchise breathes new life into the world that Spielberg made us love back in 1993.